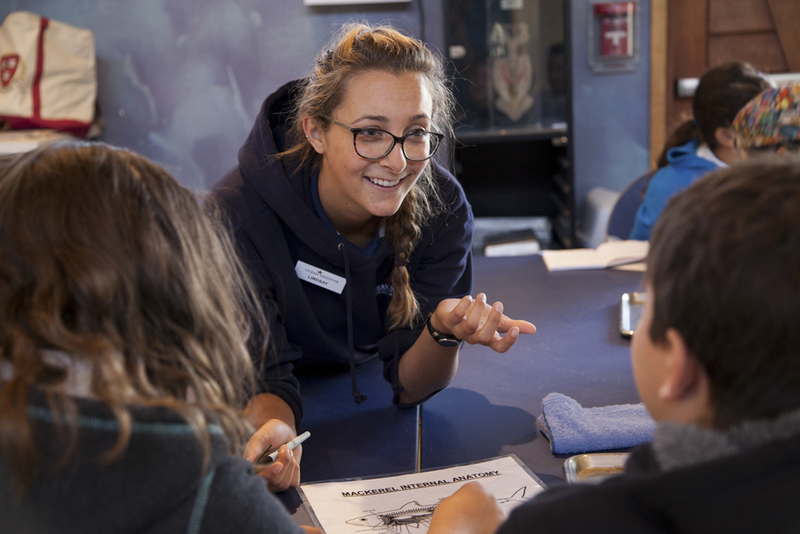 Children learn about fish anatomy in an Ocean Institute class. Cookies, cocoa and carols will be followed by the granting of a junior naturalist certificate after participants complete the eco-cruise. Science talks take place at 11:15 a.m. and 1:15 p.m.
On Sunday, Dec. 24, take a photo of picking up trash on the beach, using re-usable drink containers and shopping bags, wrapping a gift in recycled paper or creating a hand-made eco-friendly Christmas gift and post on Facebook or Instagram with #12daysatoceaninstitute. Winners will get a free pass to Ocean Explorer Winter Day Camp. The three day camp, Tuesday through Thursday, Jan. 2-4, is planned from 9 a.m. to 4 p.m. Campers will spend the day at sea on a historic tall ship, study the marine ecosystem and visit the labs and animals. Sign up for the $85 session at:oceaninstitute.org. Contact the Ocean Institute for more information.